This book tells the story of the CCC’s construction of the Virginia Kendall Reserve, which today is part of the Cuyahoga Valley National Park, in Northeast Ohio. Four hundred and thirty acres of farmland came under the control of the Akron Metropolitan Park District and its director-secretary, Harold Wagner, who immediately applied to the federal government to establish a CCC camp there with the aim of creating a natural recreation landscape open to the public. 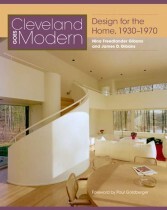 Based on the award-winning exhibition of the same name, Cleveland Goes Modern: Design for the Home, 1930–1970, examines Modern movement houses in greater Cleveland within the context of American Modernism as a whole. Beautifully illustrated with more than 150 drawings and photographs in color and black-and-white, the book features the work of six architects: Don Hisaka, John Terence Kelly, Robert Little, William Morris, Ernst Payer, and Fred Toguchi. 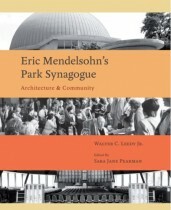 Eric Mendelsohn’s Park Synagogue tells the story of the construction of The Park Synagogue and examines how Mendelsohn consciously sought to express the ideals and traditions of the congregation and Judaism in its architectural forms. From one of the world’s largest copper-clad domes weighing 680 tons to the shape of the sanctuary and spectacular bimah, Mendelsohn sought to incorporate the architecture into Jewish ritual and worship. He favored dramatic curves of glass walls, circular stairwells, and porthole windows, and he used the circle as a dominant form throughout his career. The Park Synagogue is one of the few Mendelsohn buildings that remains virtually as it was built. In the early 1960s, Olaf Prufer argued that the Ohio Hopewell societies who built the mounds that characterize the Middle Woodland Period (200 B.C. to A.D. 400) lived in a small, scattered hamlets. Prufer’s thesis was evaluated at the symposium “Testing the Prufer Model of Ohio Hopewell Settlement Pattern” at the annual meeting of the Society for American Archaeology in Pittsburgh, April 10, 1992. Several of those essays and others, including two by Professor Prufer, are included in Ohio Hopewell Community Organization. 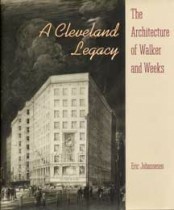 Walker and Weeks was the foremost architectural firm in Cleveland for nearly forty years, from 1911 to 1949. Its clients were the wealthy and influential of Cleveland and the Midwest; its landmark accomplishments included the Cleveland Public Library, Cleveland Municipal Stadium, Severance Hall, the Cleveland Post Office, and the Indiana World War Memorial.